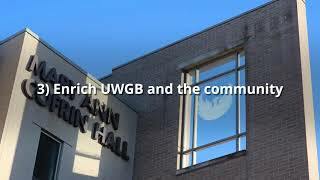 There’s a unique feature at UWGB that isn’t available at many other universities. That’s right, The Tunnels: A series of underground hallways that connect all the academic buildings on campus. It saves students from traipsing across campus in the bitter cold air in the winter and the hot and humid air in summer. While other higher education institutions in Wisconsin, like Concordia University, have some areas of campus protected from the storm, none are as inviting as UWGB’s. Being connected to all the academic buildings means students only need to wear their coats at the beginning and end of their school day. It’s a great recruiting tool, too. While the tunnels may get busy between classes, they also serve as a great study destination. Many of the tunnels have some type of seating/lounging areas that not only provide protection from the weather, but offer beautiful, inspiring views of campus. Next time you’re worried about braving the cold, never fear. The tunnels are here to serve you. COMMCrew is made up of Senior Ladies: Abby Phillips, Nicole DeBoer, Brooke Iserloth and Grace Callen. Previous Post - Previous post: Tide Pods for Dinner?